Anna paid off $23k of college, personal loans, and credit cards. 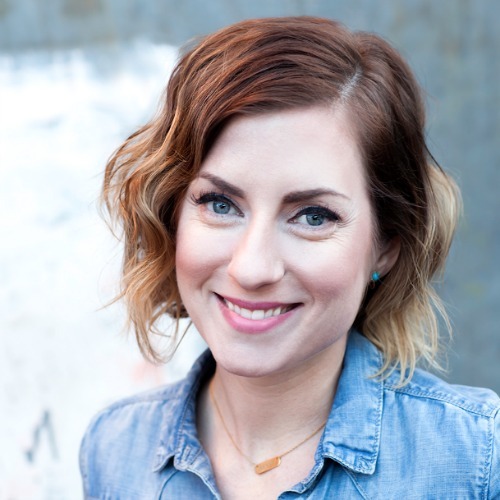 Find out how Anna paid off $23,605 in college, personal loans, and credit cards. Today’s Debt Free Story is from Anna. She is on a mission to help others become debt free. She writes at her personal finance website, And Then We Saved. 1. Tell us about you and your family. Where are you from? What do you and your spouse do for a living? I grew up in Newport News, Virginia. My family moved to Lincoln, Nebraska before my Junior year in high school. I lived there for 2 years then I moved to Denver to go to photography school in 1998. I’ve been here ever since and I love this city! My main gig is as a wedding and portrait photographer and my husband, Aaron, shoots with me. Our photography business is Newell Jones and Jones Photography. Aaron’s day-job is as a photo stylist for a national sports gear company. We have a 2 year-old son named Henry that we love to spend time with and goof around with. 2. How much debt did you pay off? What kind of debt was it? How long did it take you? I paid off $23,605.10 and it took me 15 months. It was a mix of college loans, a personal loan from my parents (for college), an overdraft account, and credit card debt. 3. What inspired you to get debt free? Was there a particular event? I had tried a lot of different things to get out of debt but nothing worked. I was frustrated, embarrassed, overwhelmed, and ashamed. There wasn’t one particular thing that pushed me to the debt-free living side. It was more that I finally got to the point where I was sick of feeling like crap about myself and I was ready to do whatever it took to try to change things. I had been overspending for about 9 years at that point and enough was finally enough. 4. Did you follow a particular debt freedom plan or book, such as Dave Ramsey or Debt-Proof Living? No. I only learned about Dave Ramsey once I started my Spending Fast. He’s great from what I can tell but I don’t follow his methods. Once I started getting out of debt I read Your Money or Your Life and it changed my whole outlook on money. Highly recommend it! 5. What are the top 3 – 5 ways you found money to put towards debt. I sold old stuff I no longer used/wanted. I learned (over time) to tell myself no. 6. What are your top 3 – 5 tips for saving money/pinching pennies to put towards paying off your debt. Same tips as above, really 🙂 and there are tons of tips and insights about this in my book. 7. If married, who initiated the debt free goal? Were there arguments during the time you were working on your debt? How did you resolve the tension and arguments? Yes, I’m married and was married when I did the Spending Fast. My husband is naturally frugal so he didn’t see the need for me to doing something as “extreme” as a Spending Fast however, I knew it had to be done. There were lot of arguments and tension during the Spending Fast. Strain on my marriage because of it ended up being the hardest part of the whole thing. We went from doing anything we wanted whenever we wanted to do it to flipping that all around. No longer was I able to participate the way I used to so that caused a lot of stress. I ended up having to give myself a small $20 monthly allowance to spend on, with, or for Aaron because the Spending Fast was causing so much tension. I knew if I didn’t give in on the Spending Fast a little bit I’d be forced to give the whole thing up. I was desperate to get out of debt so I gave in so I could keep going. That allowance eased up the tension and was enough to let me continue on with the Spending Fast. We had separate accounts at the time, and Aaron didn’t do the Spending Fast with me. 8. Who handles the day-to-day finances in your home or do you work on it equally? How often do you and your spouse discuss your finances/budget/spending? Aaron writes out the checks for the bills every month, I negotiate lower rates for things as needed, and we both put a certain amount into a joint account to buy things for the household and for Henry. We don’t have a set time or frequency that we discuss money matters. Apart from the joint account for the house we have separate accounts. I spend what I earn the way I see fit and he does the same. Just recently I noticed we were consistently running low on money in the joint account towards the end of each month so we decided to up the amount we each contributed. It works for us. 9. How did you celebrate when you became debt free? I cried, then I ate some cake. After that I wrote on my blog about how shocked and happy I was that the Spending Fast actually worked. 10. What habits did you form while being debt free that will now stick with you for the long term? Lots of things. The biggest one is that I learned how to tell myself no. There’s no way to do a year-long Spending Fast and not have it completely affect your relationship with money and spending. 11. Was there something that you gave up that you will go back to now that you are debt free? 12. What are your financial goals now? To continue to grow our photography business so that if my husband wants to leave his day-job he can. Also, to create multiple passive income streams. 13. What advice do you have for someone that is paralyzed by their debt load, but wants to be debt free? I want to encourage people who are desperate to get out of debt that there absolutely is an answer to your debt. It’s called a Spending Fast and it’s insanely effective. It requires sacrifice but it can be done if you’re willing to do it. If you want to be debt-free you have the power to be debt-free. You do not need a new job, or any other outside force to save you. You have the power to save yourself from your debt right this minute. 14. Is there anything else you’d like to add that you think would help the readers who want to become debt free? 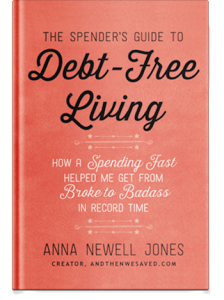 I wrote my book, The Spender’s Guide to Debt-Free Living: How a Spending Fast Helped Me Get From Broke to Badass in Record Time, so people who really want to be debt-free can have a step-by-step guide on how to do it just like I did. It works and I want nothing more than for people to know that living a debt-free life is possible. There is hope! I thought I’d die with my debt but here I am living debt-free. Trust me, it can be done and you can do it! Anna’s book is available on 04/26/16, but is available for pre-order now. Also sign up for Anna’s upcoming Spending Fast Bootcamp. Thank you, Anna, for sharing your Debt Free Story. 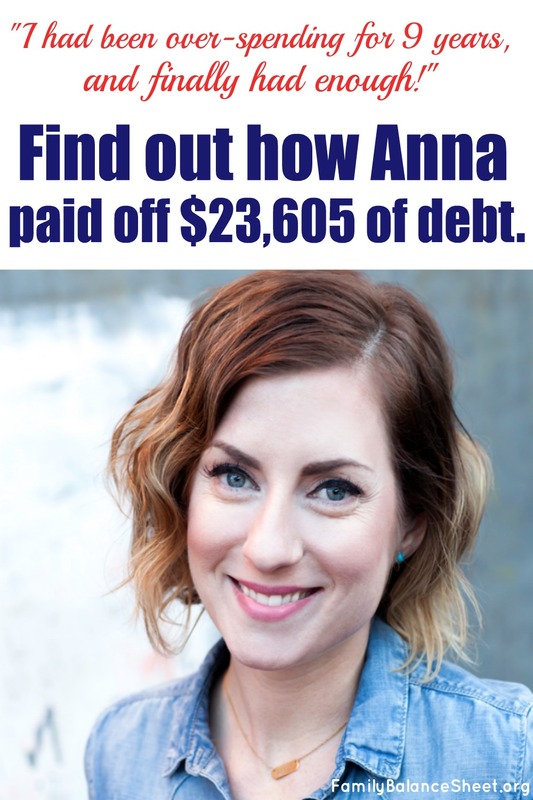 For more stories like Anna’s, go to Debt Free Stories. Would you like to share your real life debt free story? You don’t have to be a blogger to share. Send me an email at familybalancesheet@gmail.com. Put “Debt Free Stories” in the memo line and I will send you a questionnaire. Please note, I AM NOT A FINANCIAL PLANNER. This series was written based on the experiences of others who have become debt free. If you feel you need additional advice, please consult a certified professional.